This set of games is a great way to build fluency with multiplication facts through 12 x 12. 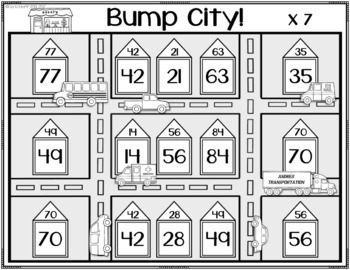 With a separate “city” (game board) for each multiplication factor from 2 through 12, it’s easy to provide differentiated practice for your students just by selecting the game boards for the facts your students need to work on. Buy this game as part of a money-saving bundle HERE! Please see the PREVIEW for a closer look at the materials included in this resource. Players multiply and cover products on the game board, bumping off their opponent's cubes whenever possible, and doubling up their own cubes to form blocks which can't be bumped. The object is to be the first person to play all your cubes. 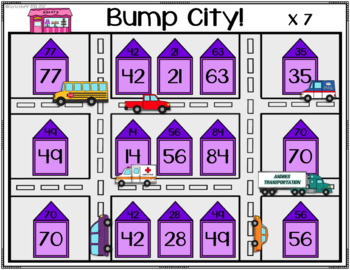 My students love to play bump games, and I love how much math practice they get while playing! 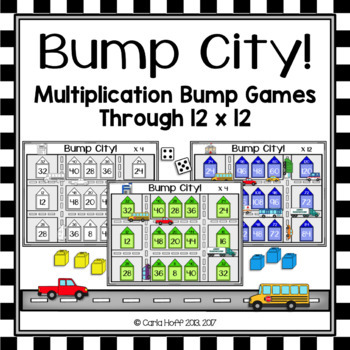 More multiplication games and resources your students will love! 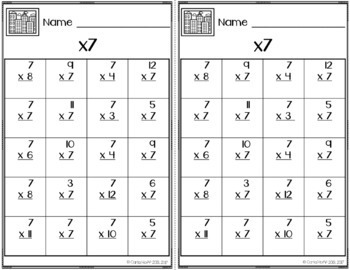 You'll find more multiplication games and resources HERE. Save money by building a custom bundle! It's like having your own private sale! Find more information HERE. Don’t forget to leave feedback for your TpT purchases and earn credits to use for any future TpT purchases. I love feedback! **CLICK HERE to follow my store, and be the first to hear about my newest resources and sales! It pays to be a follower -- new resources are 50% off for the first 24 hours! Thank you for looking! Please contact me through the "Ask A Question" tab if you have any questions.